flat assembler - Proposition for Tomasz. Select and open file in fasm. flat assembler > Windows > Proposition for Tomasz. Select and open file in fasm. Example have many includes files from differents dirs. And its not handfull allway search files in folders. In some projects includes files more then 90 ! And Fasm open file c:\fasm\include\equates\user32.inc. And this file name apply to ColectionFilesCombobox. We might later open ColectionFilesCombobox and choose any files and open them. Or fasm auto search all includes files and store in ColectionFilesCombobox. Then we just open ColectionFilesCombobox choose file and press open button. Or write in ColectionFilesCombobox name of file and press open button. Its save lot of time. Like in my Direct2D Editor. You are suggesting this for fasmw, right? You would like fasmw to scan file for file names and allow you to click, or double-click, or right-click, or something and fasmw will open it in a new tab? Its for Fasm 32 or 64 bit. I just select text and press button Open. I not needed do copy\paste text. This do my program. And file open in second EditBox. Not now i not use double click. Small right-up EditBox i use for small pices code. This small part I often write. In file ThemColor.txt in store 8 colors for colorize style. Change ThemColor.txt and get new colors and opacity. And use only mouse and mouse buttons for programing code. In right hand mouse and in left beautiful girl. If you mean Fasm. I told about all new Fasm-editor versions. We simple select text (its file name) and press key F11(for example) or right mouse open menu and we see new function "open selected file". Yes. Open in new tab. And right mouse menu new function "Show files collections"
We might choose any file and then open. Its mast be standart for all Fasm-editors. Interesting. i like the direction you are thinking - changing the development experience. There is certainly room for innovation in this area. My next idea. Sort data marker ;#SD(mean section data). When we press button "Sort" or when Fasm editor compile code auto find this and sort. And keep text file how we see in code. Very usefull when we want keep data close to code. Hard sometimes read code and variables when you must jump to section data. Look some value and jump back in code. Its not problem when values 2 or 3. But if values more then 80. It is tiring and can lead to errors. New in my Fasm Studio. I grab c++ structs or Enum or Interfaces ! PS: Can open c++ header text file. And can transform many c++ structs to Fasm structs or only selected struct or selected region. 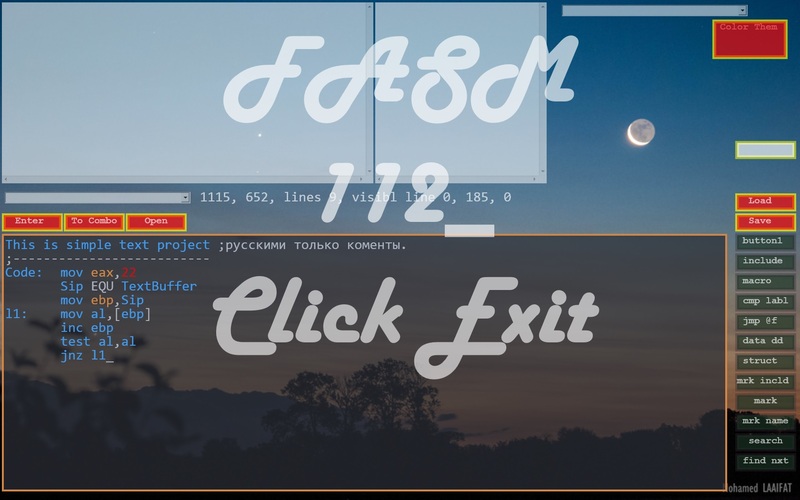 One click and we get many Fasm structs or Interfaces or Enums.